One day in the summer of 1966, a small group of people gathered deep in the woods. Shovels were wielded, ground was broken, and pictures were taken. It was the first step toward building a new church in Danvers — the Northshore Unitarian Universalist Church. Today, more than 40 years later, the church is a thriving outpost of religious liberalism. But that couldn’t have been predicted in 1966. In fact, there was considerable doubt as to whether it would even survive. What had once been four churches had become three, then two, and, finally, one. Yet the new church thrived. The success of the Northshore UU Church is testament to the vision of its founders, and of its forebears in Danvers and Peabody. The history of Unitarian Universalism in the two communities begins in 1815, with the formation of the Danvers Unitarian Society and the founding of the First Universalist Church. Services were held in a small brick schoolhouse in the Putnamville section of Danvers (then known as Blind Hole), in the northern part of town, not far from where the current church stands. The society’s Declaration of Principles was signed by 24 people, 20 from Danvers and four from Wenham. Several members were descendants of Edmund Putnam, the first prominent advocate of Universalism in Danvers, who had resigned as deacon of the First Church in Danvers in 1785. Although services appear to have been held at the schoolhouse over the course of the following decade, by the mid-1820s the First Universalist Church was fading away. In 1829, the church was succeeded by a new organization, the First Universalist Society of Danvers, with 18 charter members. Services were held in a Baptist church and in schoolhouses in Danvers Square and what is today West Peabody. The First Unitarian Church of Danvers. It later became the First Community Church of Danvers and, finally, the Unitarian-Universalist Church of Danvers. The Universalist Society embraced the cause of Abolitionism, approving a resolution in 1841 that stated “it is our imperative duty as Patriots, as Philanthropists and especially Christians, to exert our utmost at all times and under all circumstances, in accordance with our own consciences, for the immediate and final overthrow of American slavery.” In 1859, the First Universalist Church of Danvers, as it came to be known, moved into a new, permanent home, at the corner of High and Park Streets in Danvers, where it remained until the first of the church mergers took place more than a half-century later. Universalism was well-established in Danvers for most of the 19th century. Unitarianism, by contrast, came relatively late. In 1865, the Reverend Alfred P. Putnam, a Danvers native who had been preaching in Brooklyn, New York, decided to come home and begin the Unitarian Church of Danvers. Twenty-one people attended the first meeting of the Unitarian Congregational Society of Danvers, and $542 was pledged to support the new venture. Services were held at Town Hall for several years. 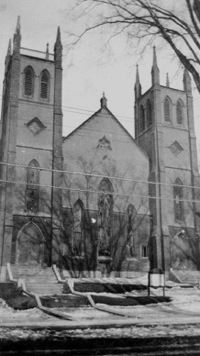 A new chapel near the center of town, at the corner of High and Porter Streets, was dedicated in 1871. Early in the 20th century, Unitarians and Universalists in Danvers and, as we shall see, Peabody began to understand the advantages of uniting around their common liberal religious beliefs. Nationally, this unity did not occur until 1961, when the American Unitarian Society and the Universalist Church of America merged to create the Unitarian Universalist Association. Locally, such combinations began much earlier. In Danvers, a coal shortage during World War I, shrinking congregations, and the departure of the town’s Universalist minister led the Unitarians to invite the Universalists to share their chapel at High and Porter Streets. For several years, the Unitarians and Universalists maintained their own governing structures and annual meetings. 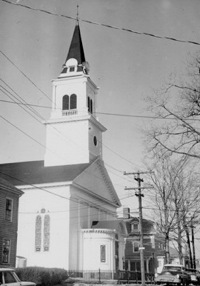 But in 1924, they joined to form one congregation, which was named the First Community Church of Danvers. A UU church in fact, it became one in name as well in 1945, when it took on the identity of the Unitarian-Univeralist Church of Danvers — one of the two surviving churches that would later form the Northshore UU Church. A similar process of winnowing-out had also taken place in Peabody, to which we will now turn our attention. It was earlier observed that Unitarianism did not come to Danvers until 1865, but that is not entirely true. In fact, the Unitarian Church of Danvers was founded in 1825. 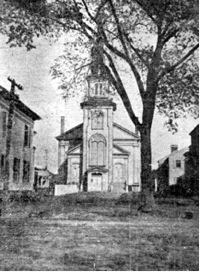 This church was located on Park Street in South Danvers, part of what would become the town (later the city) of Peabody in 1868. The Second Universalist Church, also located in what would become Peabody, was established in South Danvers in 1832 by 43 people. A church building was dedicated the following year. At some point following Peabody’s incorporation, the church became known as the First Universalist Church of Peabody. Historical records suggest that the Peabody Universalists enjoyed a more stable existence than the Unitarians. As was the case in Danvers, members of the two churches held joint services during World War I in order to save coal. The Unitarian Church — known during this period as the First Unitarian Church of Peabody — also discussed a possible merger with the Universalist Church as well as with the South Congregational Church. The Peabody Unitarians attained a new level of success, however, after they voted in 1926 to call a new minister and rebuild. In 1947, just two years after the dedication of the Unitarian-Universalist Church of Danvers, the two denominations in Peabody came together to create the Unitarian-Universalist Church of Peabody, also known as the Park Street Church. But oddly enough, though the two Peabody churches had essentially become one, they did not formally unite until 1965, just before the final merger that created today’s Northshore UU Church. By the 1960s, both the Unitarian-Universalist Church of Danvers and the Park Street Church of Peabody were weak, shrinking, and in danger of disbanding. 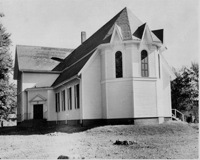 Rather than attempting to consolidate, members of the two churches decided instead to take a bold step: to build a new church aimed at attracting people throughout the North Shore who were interested in liberal religion. The location, in Putnamville, was chosen specifically for this purpose. It is as close to the center of Topsfield as it is to Danvers, and is easily accessible from many different communities. Today, the Northshore UU Church attracts members from a variety of nearby cities and towns, including Danvers, Topsfield, Middleton, Beverly, Peabody, Salem, Hamilton, Wenham, Ipswich, Rowley, and Boxford, among others. The Park Street Church in Peabody. The only one of our predecessor churches that is still standing, Park Street was the source of our bell and the wood paneling our the board room. Construction took place for a year following the groundbreaking ceremony in 1966. Much of the work was carried out during the winter months, with heaters keeping the site warm beneath plastic canopies. During this time the new congregation met at the Park Street Church, the only one of the predecessor buildings that is still standing. The new church was completed in the summer of 1967. The merged congregations decided that it would be inappropriate for either of their ministers — the Reverend Frederick Rutledge, of Danvers, or the Reverend G. William Budd, of Peabody — to assume the pulpit of the new church. The Northshore Church’s first called minister, the Reverend Charles Wilson, served from 1966 to 1971, a tumultuous time of war and social change during which he recalls helping young men attain conscientious-objector status and counseling women who were seeking to end unwanted pregnancies. Wilson later moved on to the Unitarian Universalist Church of Marblehead, and returned to Northshore as a member following his retirement. Wilson was succeeded at Northshore by the Reverend Edwin Lynn, who served until his retirement in 2005. Despite the Northshore UU Church’s modern appearance, it contains a number of touches that reflect its historical heritage. The Park Street Church, in particular, has been a rich source, providing the 2,700-pound bronze bell, first installed in the belfry in 1829 and moved to its setting at the edge of the woods in the early 1970s. The wood paneling in the board room of the Northshore Church comes from Park Street’s pews. By contrast, the most recent addition to the church, the Edwin Charles Lynn Fellowship Hall, was dedicated in 2002. 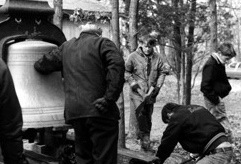 The bronze bell from the Park Street Church being installed outside the Northshore UU Church in the early 1970s. Thus is our church both new and old. It occupies a building dedicated just 39 years ago, yet its roots go back to 1815. Its bell and some of its woodwork extend to the 1820s. Its commitment to social justice can be traced to Abolition. Its first minister left in 1971, yet he returned to become an active member. This unique blend of tradition and progressivism is a defining characteristic of our church.